Kicker [W][W] (You may pay an additional [W][W] as you play this spell.) Flying. 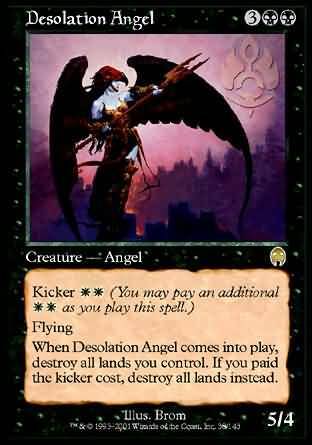 When Desolation Angel comes into play, destroy all lands you control. If you paid the kicker cost, destroy all lands instead." When Desolation Angel comes into play, destroy all lands you control. If the kicker cost was paid, destroy all lands instead.